Who would have thunk it? GolfCentralDaily are actually winners! The team consisting of yours truly, Tom Tanner of Golfbidder, golf columnist Phyliss Barone and Kevin Downing emerged victorious at the Golden Bear Club on the annual Irish Golf Day ahead of the 2017 PGA Show. GolfCentralDaily's winning team at the 2017 Irish Golf Day at the PGA Show. Over 100 people played in the event organised by North and West Coast Links and Swing Golf Ireland and backed by the Irish Tourist Board. 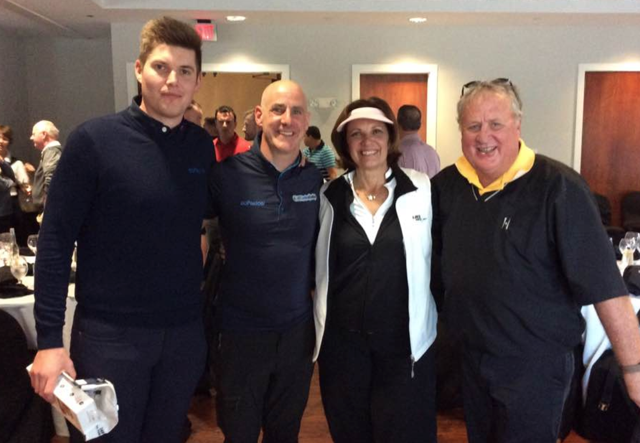 Celebrities at the event included Mrs Brown herself aka Brendan O'Carroll and wife Jennifer, golf broadcasters Charlie Rymer (Golf Channel) and Matt Adams and former Ireland soccer captain Ronnie Whelan. Here's a facebook post with all the winners. Trick Show king David Edwards had great fun with a Chinese guy. Charlie Rymer told a story about understanding the Irish accent.